Home > Read All About It > I'm Not John > Is this what the Northern Powerhouse vision looks like? 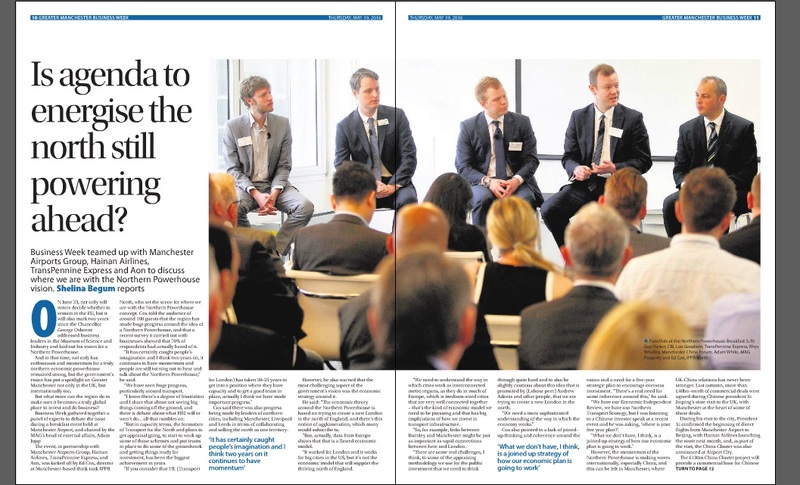 This week’s edition of the Greater Manchester Business Week poses the question in a four-page article: is the agenda to energise the North still powering ahead? But from what I can see, the visionaries for the Northern Powerhouse movement need to be more than energised – they need a rocket up their arse to firstly look at progression and diversity. In order for Manchester to become a ‘supercity’ to rival London and global business leaders, we need women to be an integral part of the Northern Powerhouse agenda and looking at the photo of the panel – or should I say ‘manel’- it does not look like there is a fair representation. 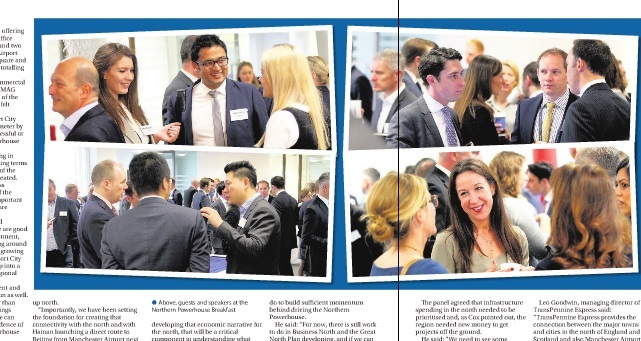 The image is from an article reporting on a breakfast meeting – hosted by the Manchester Evening News – to discuss how the Northern Powerhouse is progressing. But, I keep asking myself, is this really what the Northern Powerhouse movement will look like? They say a picture paints a thousand words. And the image, not only of the panel, but in the rest of the article, shows me that progression does need to be made, in equality. The event was held in conjunction with the Manchester Airport Group, Hainan Airlines, TransPenine Express and Aon. Do no women work for these organisations or people of ethnicity for that matter? Could they not have been invited on the panel? Or were they serving drinks and looking pretty? While I do not dispute that the content is interesting – and that women must have been there taking part in the discussions and maybe even on other panel debates, where are they in the images? It says there were 100 guests, I would love to know the ratio of men and women, as the pictures show me mainly men in suits. It further shocks me that the only people quoted in the article are men across four pages – FOUR pages! The only saving grace is that the article was written by a woman. 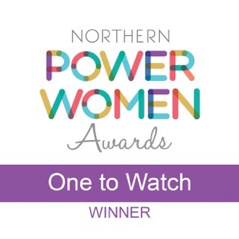 Last November, Yellow Jigsaw, launched a campaign #imnotjohn, which the MEN kindly reported on, to inspire women to rise up the ranks in their professions by showing them that there are women at the top across the North West already. So we know firsthand that there are plenty of successful business women available to sit on these types of panel debates to represent a northern woman’s voice. This ‘manel’ – a male only panel of experts – has to be stopped. But I am not looking for a token woman either. I don’t want to be humoured, I want a change in attitudes that means those who choose these panels don’t just go on auto pilot and pick the same faces – probably faces that look like their own. It is the default man syndrome! How do young women have a chance of feeling they can succeed to leading positions if they can’t see role models in the same positions as the male counterparts? And how will young men be given the chance to change the way they react (or fail to recognise more to the point) that this lack of representation is simply wrong and quite frankly bad for business and the economy that we are trying to better with the Northern Powerhouse vision! But let me make it clear, I am not man hating, the last thing I want is women on one side of the fence and men on the other – this is not a battle between the sexes, it is a battle that we need to work on together. Gender inequality is not just a female problem- it is a problem for our businesses, and a problem that affects our economy. We all need to stand up to this issue, if you are not part of the solution – you are part of the problem. So we will lay our stall out, if you are struggling to find one – or maybe two women – God forbid – for your next panel – get in touch! We know plenty of great candidates. Wake up. This is Manchester! I thought we did things different here. Yes, we may be leading the way with the Northern Powerhouse movement around the globe – but we should be leading the way for culture change in our own city first.